Attorney Charlton Allen’s nomination by Governor Pat McCrory to serve on the quasi-judicial Industrial Commission has come under fire. An article today by the Independent Weekly lays out some of Allen’s “Racially Dubious Past”, in particular his activities while a student at UNC Chapel Hill in the early 1990s. 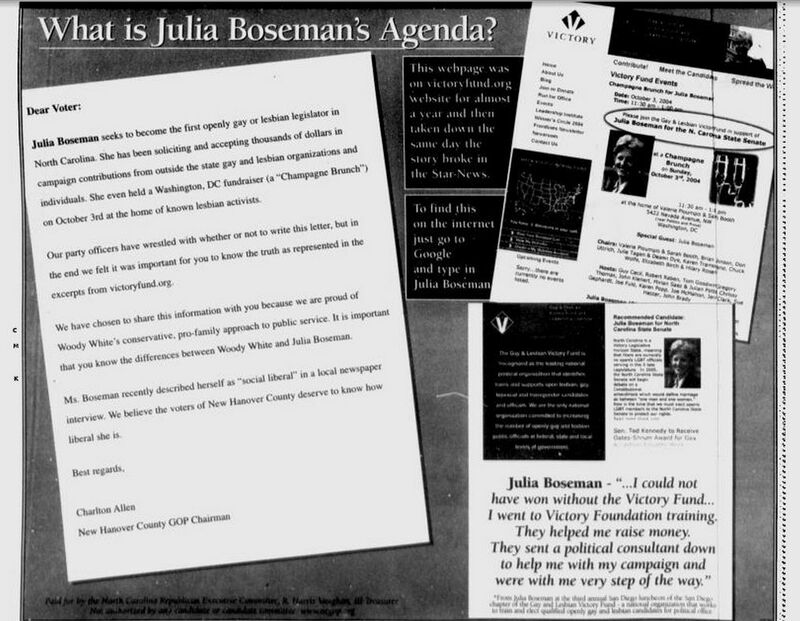 In 2004, as Chair of the New Hanover Republican Party he was responsible for anti-gay smear tactics against Julia Boseman, running for a State Senate seat, which the Wilmington Star-News newspaper found so despicable that it rebuked Woody White, the GOP incumbent it had endorsed. Allen had signed a letter that appeared as part of an ad in the Wilmington newspaper and a 4-page glossy mailer was distributed by mail just prior to the election. Boseman went on to win the seat. The North Carolina Industrial Commission is an agency of the State of North Carolina created by the General Assembly in 1929 to administer the North Carolina Workers’ Compensation Act. In 1949, the Industrial Commission was also given authority by the General Assembly to administer the Tort Claims Act. Additionally, the Industrial Commission is charged with administering the Law Enforcement Officers’, Firemen’s, Rescue Squad Workers’ and Civil Air Patrol Members’ Death Benefits Act, the Childhood Vaccine-Related Injury Compensation Program and Compensation to Persons Erroneously Convicted of Felonies. Allen expressed his opposition to minimum wage law, collective bargaining, paid sick leave, lunch breaks in responses to a 2012 Civitas questionnaire. His public statements and actions cast doubt on his ability to “effectively and fairly administer” worker and citizen protections. However his nomination has been confirmed by the House and is likely to be confirmed by the Senate, despite his dubious past. This entry was posted in Uncategorized and tagged anti-gay, Charlton Allen, homophobia, Julia Boseman, minimum wage, NC Industrial Commission, Pat McCrory, sick leave. Bookmark the permalink.